**This is a guest post ! Please see the bottom for author details. Since I have been blogging over at Productive Happiness, I discovered that my best ally to make things run smoothly for the blog has been my Bullet Journal. 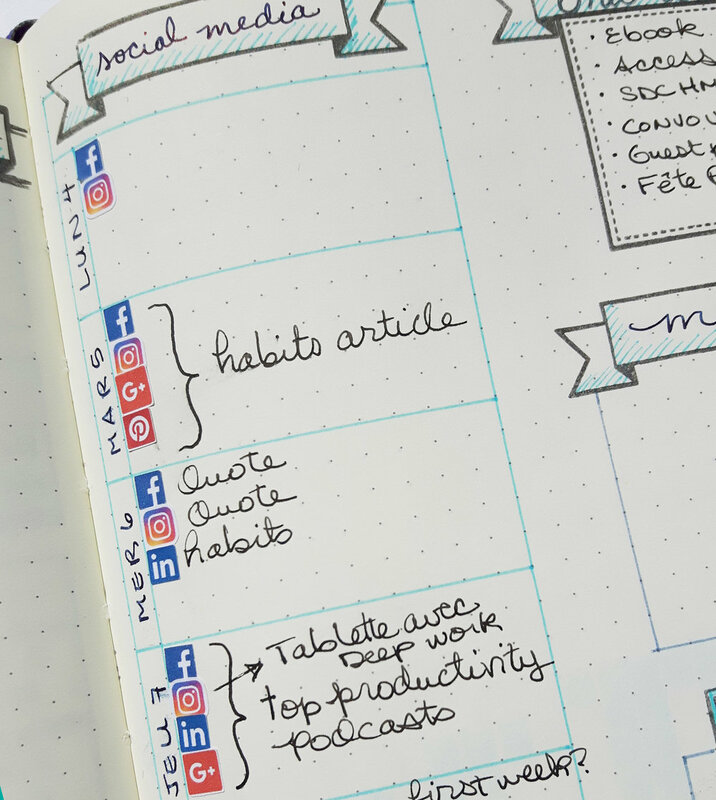 Planning in my Bujo has allowed me to write better blog posts, be more efficient with my posting schedule and manage my social media presence seamlessly. I’ve also been able to visually track my progress and course correct over time for better results. I just can’t live without. In today’s article, I’ll be taking you through my journal with real-life examples of how I use my Bujo in my blogging process. Maybe you are wondering what exactly is a Bullet Journal. In a nutshell, it is any blank notebook in which you write down your tasks, projects, lists and everything you want to keep track of. The principle is to rapidly log your ideas as the day goes by, using bullets, or signifiers to keep track of what type of items you are writing down. If you’d like to know more about the Bullet Journal method, I suggest you start by reading this in-depth article. But the tips I am going to offer you today can be applied in any notebook, even if you are not following the basic Bullet Journal format. 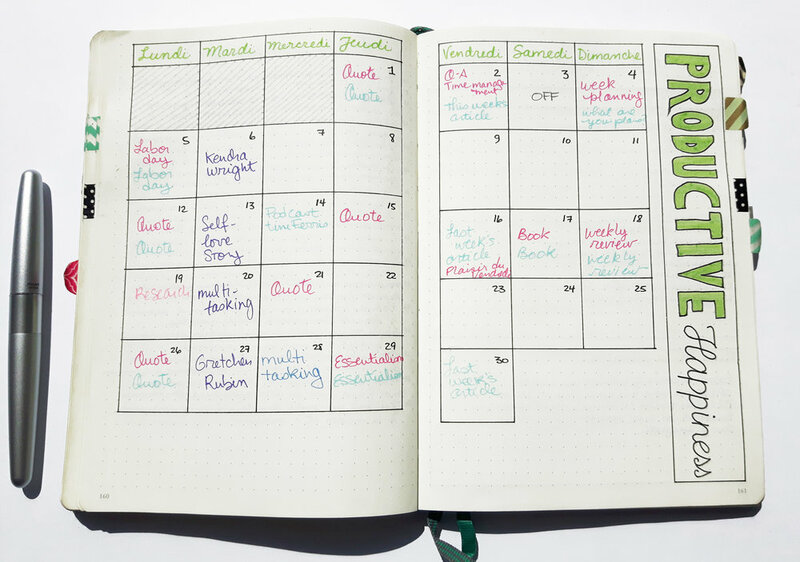 The Bullet Journal has you covered every step of the way for your blogging needs. The first step that I like to go through before I write any article is brainstorming. I also like to brainstorm for new products, collaborations and social media ideas. My preferred method for brainstorming is the classic mind-map, a visual tool used to represent the different parts of a given topic. Here’s a mind-map I created when I was brainstorming the themes I wanted to cover in my blog. I like to keep a draft of what I would like my weeks to look like. I like to theme my days, for example Mondays are for writing, Wednesdays are for strategic thinking and planning and Fridays are for reviews and stats tracking. It helps me spread my tasks over the week and put me in the right mood for different tasks at different moments. I keep a visual representation of my ideal week in my Bullet Journal and tweak it as needed. I have to admit that I am a data freak. I think that my favorite part of planning for Productive Happiness is tracking my stats and analyzing the results. My goal is to learn from my mistakes AND my successes in order to keep improving my blog and my income. A basic stats tracker along with a space designated to journaling is what helps me keep on track of what’s working and what’s not. At the end of the month, I like to compare my stats with those of the previous months to see if I am progressing or not. So far, I am thrilled to report that my stats are booming! My comparative stats tracker is super simple, but clear enough to spot patterns and trends. 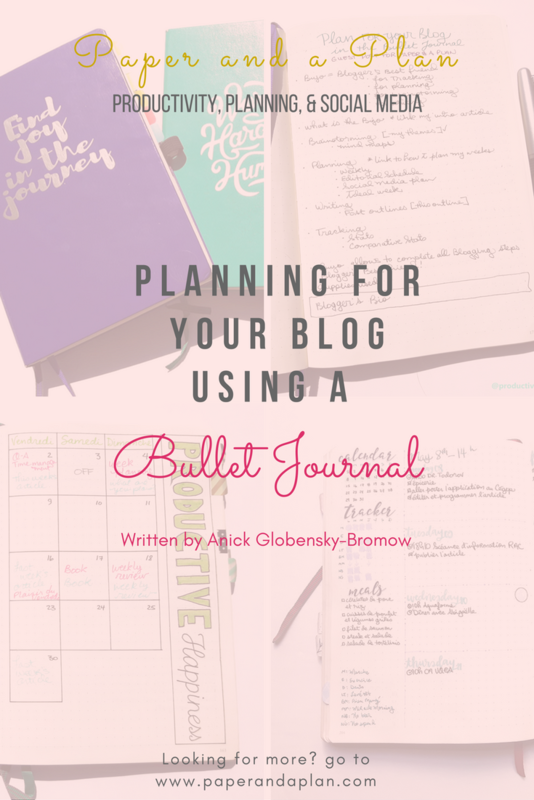 As you see, there is a lot you can get accomplished for your blog using the Bullet Journal method. Every part of the blog is covered, allowing you to brainstorm, plan, write and track your stats. Since the Bullet Journal is so customizable, you can tailor your notebook to your specific needs and tweak your system at any time. And most of all, the journaling process is fun, creative and so relaxing! Give it a try, I am sure you’ll find something to love in the process. Anick Globensky-Bromow is a productivity Blogger with a focus on helping her readers take their happiness in hands. Over at Productive Happiness, she writes about the Bullet Journal, productivity tips and techniques as well as happiness hacks in her weekly blog posts. You can follow her on Instagram for Bullet Journal goodness and on Facebook for her weekly videos.